These are things I will never use again but can't bear to throw in the rubbish bin. If only I can find a home for them I will be happy. Help me and I will help you. If a convenient arrangment can be made I am willing to drop an item off in the Melbourne area at a time of mutual convenience. Or, you can stop by and pick one up. All items are free. Many thanks to a geography teacher for taking a box of China Pictorial and the Scientific Americans. I hope some kids find them of interest! These items come mainly from my father's period of service in the army and airforce during World War II. 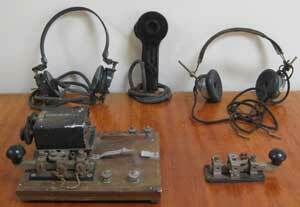 They are field morse code transmitters and telephony instruments. Also a pair of WWII army binoculars. This one goes back to the 1950s. I did study chemistry to university first year level but I guess it was never something I got comfortable with. After many years in my father's attic I would now like to dispose of this collection where it may be useful. However there is also an historical angle with this stuff. 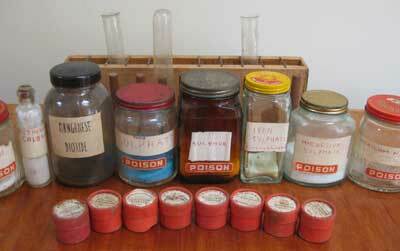 A number of the compound containers are from H. B. Selby and Co.; see the little round set among the jars in the photograph. They were bought at the time this company had a famous shop in Swanston St., Melbourne, just opposite the then Royal Melbourne Institute of Technology (RMIT). Everyone who wanted laboratory or chemistry supplies shopped there for many years. You can google the history of this company. Text © Copyright Craig Robertson, 2013, except where otherwise attributed.